Our aluminium walkways are manufactured in accordance with BS EN ISO14122 Part 2: Working Platforms and Walkways. The system provides safe access on a wide range of roofs, allowing your facilities team to carry out essential cleaning and maintenance tasks. We can supply aluminium walkways with handrails and optional toe boards. When specified with guard rails and access ladders it can form a collective measure that ensures anyone accessing the roof does so in a safe, compliant manner. Aluminium walkways provide permanent safe access across fragile roof coverings when fixed to any good quality structure that is capable of withstanding the additional loading. 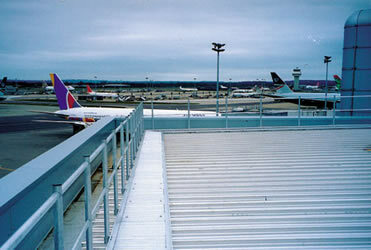 Our aluminium walkways are lightweight and strong. When combined with our cable or track system in restraint or fall arrest, along with steps and ladders, it ensures your roof has end to end safe access. Steps can be used for safe access of inclined roofing areas and to step over obstacles. Our levelling systems means that the aluminium walkways can be used to provide safe access when traversing a pitched roof. What standards do walkways need to comply with? BS 6399-1:1996 Loading for buildings. Code of practice for dead and imposed loads. The Provision and Use of Work Equipment Regulations (PUWER) 1998. This requires that walkways are inspected at least every 12 months by a competent organisation. Why do I need a walkway? Why choose an aluminium walkway? All walkways should be inspected by a specialist work at height company like Heightsafe Systems at least every 12 months. As part of our joined-up approach we can offer this service anywhere in the UK. Along with testing and inspecting our own aluminium or uPVC walkways, we can offer this service for other manufacturer’s systems. We can also deliver efficiencies to customers by carrying out testing and inspection of all other work at height, PPE and lightning protection equipment during the same visit. Call us today to find out more: 0203 819 7199. What type of roofs are suitable for aluminium walkways? Walkways from Heightsafe can be joined end to end to form a continuous run. Alternatively, they can be installed side by side to create safe deck area. We have installed our Heightsafe aluminium walkways in many situations such as cleaning access walkways on multi storey commercial buildings, maintenance walkways for atriums. For more information on our aluminium access walkways and other height safety equipment, please contact 0203 819 7199, and please feel free to ask about our free of charge survey.